I had just done work in New York advocating for marriage equality, and I had written some pieces for national outlets that had been widely shared. The letter had been sent from another state and to the church’s box and not my own (a box anyone in the area could have easily known). The postmark was also from Florida, and so I assumed the letter was from someone I had never met, and never would, who simply disagreed with my writing. At home I laughed it off. I pointed out the irony of the fact the sender had chosen a stamp with the word “Equality”. I joked with my wife about putting it on the refrigerator. I told worried church members who had heard about it that it was nothing, and they shouldn’t be concerned. I’d received anonymous emails, and even texts like this before. What I didn’t tell them is that they’d never been quite this hateful. I didn’t tell them I’d taken the letter to the police and been told they could do nothing. And I didn’t tell them that on Sunday mornings when I preached I now kept scanning the back of the church, waiting for the doors to open. He didn’t. He had no ill intent at all. But that day I realized just how much fear I had been carrying around with me. I don’t know why that memory came back to me so strongly last night when I heard about the shooting in Charleston at Emanuel AME Church. But it did. It hit me like a ton of bricks, and made my stomach turn. And it made me think of driving through the streets of Atlanta when I was a college student there. It reminded me of driving past Ebenezer Baptist in Sweet Auburn or The Temple on Peachtree and every other house of worship that had been targeted during the Civil Rights movement. I used to think about what it must have been like back in the days that people hated so much that they’d try to blow your church or synagogue apart. I know now that those days are not in the past. I know the fear I lived with for a few weeks is nothing compared to the fear that others live with all their lives. And I know that for many they would give thanks if their worst experience was a hateful anonymous letter in their church mailbox. 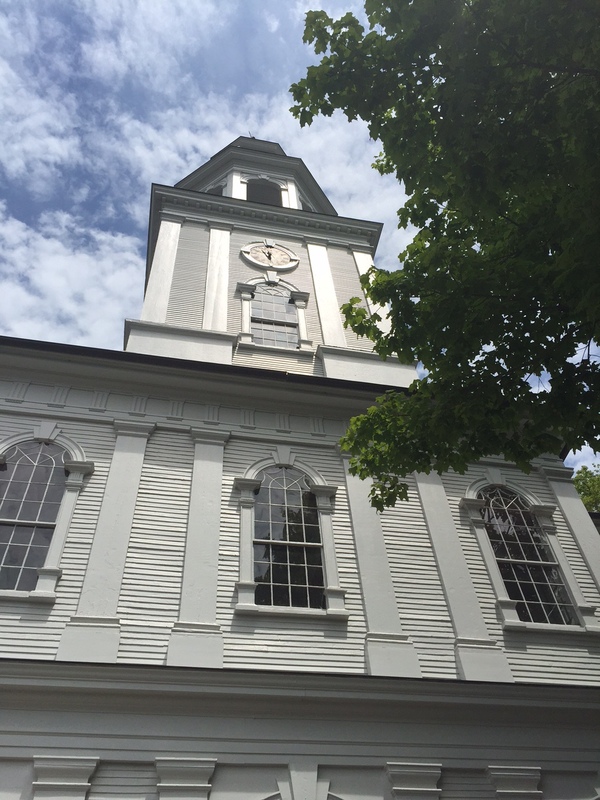 Today at noon I rang the church bells here in Exeter, New Hampshire. It was a beautiful, sunny day; the kind that make me never want to leave New England. And I sat on the front steps of the church afterwards and marveled at the dichotomy between a night of terror and a day of beauty, and between my life of mainline white Christian privilege and the life of constant fear that too many of the faithful face. I thought about a church gathered for prayer and Bible study last night, and how they had opened their circle to let a stranger join them. And I thought about a mosque in Arizona, and how the faithful walked past angry, mocking crowds with guns in order to worship. And I thought about the temple in Maryland, and the anti-Semitic graffiti they found one morning this spring. There’s a reason the hateful choose houses of worship. It’s because that’s where so many of us put our hope. You can commit a hateful act anywhere, but if you really want to hurt a community, you choose the place they worship. You bomb the synagogue. You shoot up the church. You point your gun and shout at small children trying to get into the mosque. That’s how you cut the faithful so deeply that their hearts never stop bleeding. But the ones who choose to do evil in the gathering places of the faithful forget one thing: These are not mere buildings. They are the symbols of communities, built often in resistance to hate. They are the places first built by new immigrants, or freed slaves, or spiritual refugees, or genocide survivors. They have known pain before. And they know how to survive it, and transform it. They know how to thrive in the face of the worst that the small-minded and hateful can do. And they know how to live with a faith that those who take up violence will never understand. Today we ring bells. A small, insignificant-seeming act. And yet, there is meaning. The bells are tolled in remembrance for each life lost. And the bells are tolled as assurance that God is always with us, even in the midst of great evil. But we cannot forget the last reason we toll the bells: as a divine wake-up call to ourselves. The bells are saying it is time to do the work of justice. It is time to stand against hate. And it is time to call the evils of racism and bigotry, and the terrorism that comes with them, by name. The bells cannot keep silent. And if we really believe in this faith we proclaim, neither can we. A question to ponder. “Why do the Hateful choose to attack the places we worship? I am filled with anger still this morning and not words. Anger that I have no quick solutions where others have failed, anger that I can’t heal broken families and broken bodies, anger than i can’t seem to do anything but be angry…. Because I couldn’t say better what I’m thinking these past 24 hours, I’m sharing this post from Emily Cheath. “They have known pain before. And they know how to survive it, and transform it.” Yes. Previous Previous post: Bravery is Not a Contest.